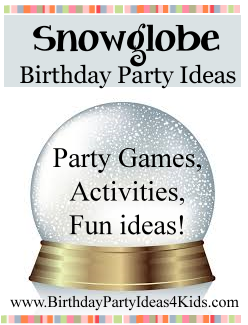 Snow globe party ideas, party games, activities and fun ideas for kids, tweens and teens. Everyone loves snow globes so we've made it into a party theme that guests are sure to love! Have players sit or stand in a large circle and give one player a blown up balloon. The player calls out a holiday or Christmas item (reindeer, snow, Santa, etc.) and then hits the balloon towards another player in the circle. The player must catch the balloon and immediately call out another holiday item. After calling out the holiday item they hit the balloon towards another player. If a player can't think of a holiday item to call out or repeats one that has already been said they are out. After the players have played for a minute add in another balloon or ball and have them both going around the circle at the same time. Continue adding balls until you have 4 balls going around the circle making it look like a snow globe! Divide players into 2 teams. Players in each team form a line and hold hands. The player on the end takes the hula hoop and passes it through their body to their other arm and then to the next person in line. Teams have to hold hands the entire time. The first team that passes the hula hoop through their line and back wins! Teams try to be the first to move from start to finish line by using only a few pieces of paper or "icebergs". Cut large iceberg shapes from white or light blue poster board about 15" x 15" each. Give teams one more iceberg then the number of players on the team. Teams	can only use the icebergs given to them to get from one end of the room to the other. Teams use the iceberg pieces to move by having players stand on the ice burgs all together. Then they take the back iceberg and hand it down the line to the front of the line and so on. If a player steps off the iceberg into the water they all go back and begin again. Variation: Divide the guests into smaller groups of three or four and give them only 2 large icebergs. Party guests play freeze dancing on a floor filled with white (you can also add red and green) balloons. Gather the party guests in the snow and tell them to dance while the music is playing, but when the music stops they must freeze in the position they were in until the music starts playing again ... then they can unfreeze and dance. Before the party begins blow up lots and lots of white balloons so that they completely cover the dance floor. Kids really like this game and dancing around kicking through the balloons. Remove any popped balloons pieces right away. This game is played just like the game Hot Potato. For a snowball use a white beanbag, ball or fill a white balloon with flour. You will need Christmas / Holiday music. Party guests gather in a circle and a snowball is given to the birthday child. Tell the guests to pretend that the "snowball" is hot and when it's passed to them they have to quickly pass it to the next person. (The game can be played by passing the snowball around in a circle, or let the kids toss it back and forth within the circle.) After they "snowball" has gone around a few times stop the music and whoever is holding the "snowball" is out. Continue playing until there is a winner. Guests can be given a small consolation prize when they leave the game. The day before the party place small toys inside an ice cube tray, fill with water and freeze. Give each guest a frozen ice cube and on “go” they must try to be the first to get the toy completely unfrozen. They can use only their hands, breath or body to get the toy out of the ice. Fun game and kids love it! Let party guests make their own snowglobes with small baby food jars. You'll need small holiday themed plastic or ceramic items, water, glycerin, silver glitter.